This week's winner is sandi m. Congratulations! You have won a pair of copper links and ear wires by Miss Fickle Media! Send Erin an email with your address and she will get your prize out to you soon! At any rate, I am so lucky to live somewhere that inspires me. If I am feeling at a loss for ideas, heading out for a hike in the hills usually does the trick and clears my always cluttered mind! In a town called Ojai. A place that I am happy to call home. What inspires you to create? 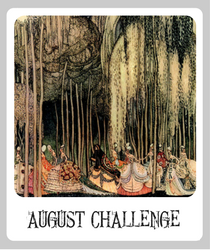 Do you have any tricks for finding inspiration when your creativity is at a low? Leave a comment answering any of these questions and you will be entered for a chance to win a ceramic pendant and bead bundle from Gaea Handmade. I use pinterest, and blogs, sometimes a book or random pictures. 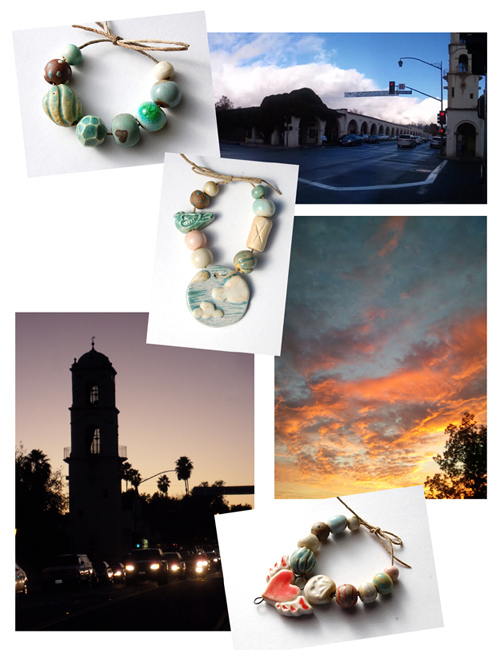 What great photos of your home town Ojai. I live in Kansas where the weather changes daily. It can be very interesting, or frustrating, depending on the way you look at it. I've been lusting over your beads for some time now. Those bundles are just the sweetest, and are an inspiration in themselves. When I need to be inspired to create I browse the web, or flip through my huge stash of magazines. I could be inspired by basically anything to be honest. Being alive and all the things under the sky that exists. Most often of course things I find pretty, beautiful or exciting in some way. But if I feel uninspired or low on creativity I would possibly seek for something unexpected to inspire me. Something new and fresh for me. I love your beads and bundles Gaea! I find beautiful beads like yours inspiring! I do find a lot of inspiration looking on the internet, whether it be at art beads, gemstones, or the beautiful work of other jewellery artists. I've always been an outdoors girl, so I find nature quite inspiring. It's hard not to be inspired! But when I do have a lull, I think it's part of it. Taking time to relax and find inspiration naturally usually does the trick. I take inspiration from nature, the ocean & I love Pinterest. I also use postcards from beautiful places to give me ideas! Right now I have a pretty one from Prague wiypth ome gorgeous blues & golds! I'm a water-girl, myself, so when I'm low on inspiration I think of the ocean and other types of water. I look through photos that I've taken, and I have my collection of shells and sea glass on a shelf in my studio. I also have lots of "beach-y" items that I can look at to get inspired. I'm on Pinterest, which is self-explanatory as to how it can inspire me, and I have my own REAL "inspiration board." I use Pinterest mostly for tutorials/DIY instructions, and my actual bulletin board for cuttings from magazines-- usually fine jewelry styles that I'm borrowing design elements from! I'm also a member of ColourLovers website~ there is always something new that can inspire over there! There are fresh palettes of all colors of the rainbow, and you can make your own using photographs. It's great for those days when I'm not feeling 100%, and I want to try a new color combination to cheer myself up-- every time I'm over there, I find at least one new way of looking at color, and a different combination that I can use for my beading. One thing I don't find inspiration from is looking at the pile of beads sitting in front of me crying out to be formed into some amazing piece of adornment. I need to find my head, funnily enough I can't do that without cleaning the house first (YUCK!). I find inspiration from photography usually, colour combos, and nature, I live in an amazing part of south east Queensland which the landscape turns for undulating valleys to rainforest mountains, the cool air and waves in the landscape bring out my spiritual and creative sides. I'll pull out my books or back issues of bead magazines; sometimes just make little bead soups and let them simmer. When I am in a 'funk' I just leave everything and go do something else. Sometimes I surf the web, take a nap etc. Then when I go back to the beads, I let them speak to me. I work in a mess, everything just laying all around, I find that most of the time there is a pattern just laying on the table waiting for me to see it!!! Actually I think its 'angels'. Works for me!! I get inspired by looking through my favorite shops on etsy--both seeing what other jewelry artists are doing, and looking through my favorite supply shops for interesting components. I'm often inspired by seeing what others' make. Whether through blogs or magazines something as simple as a shade of color they used or a twist of wire will inspire a whole other idea for me (I promise I don't copy designs) As well, I often dream designs. I'll simply wake up with a design idea in my head. Both of these sort of inspirations immediately go into my sketchbook to attempt on another day. So, when I'm stuck and the beads just aren't speaking to me, I flip through my book and work on the ideas I've saved there! Of course, pure sunlight can bring out the most inspiration in me. I full a surge of energy when the sun is shining bright and will just sit and work for hours as long as it stays bright. It's like fuel for my soul. Desperation is a great motivator for me. There's nothing like the approach of a deadline to get me started--finally. I can usually find inspiration from looking at magazines or books. I also live in a beautiful place (Vermont) and I can be inspired by just looking out my windows! My husband is a wonderful flower gardener and I study color combinations of flowers and foliage to get ideas for my enameling. Love your beads! I sometimes dream about a design and then make it. I get inspiration from the beads laying around my work area. I have a customer that always challenges me with themed jewelry. Blogs, ABS and my bags of ideas (beads) that I will eventually get to (I hope), also, inspire me. Thanks for a nice giveaway Gaea! When I am in a crunch, I go outside and look to nature, or read through some jewelry mags, or try "cleaning" up my bead stock and usually something will hit me and I am back in the saddle. I simply love the "gaea" goodies - lovely pastels and earth tones for flowers,lady bugs,love letters and mermaids! I take inspiration from experiencing the four seasons I get to see in the washington dc area....colors and textures from foliage and flora fauna, clothing and accessories on my train commute, seasonal vegetables and fruits from wholefoods across my home, and my favorite indian fashion designer from his facebook profile! 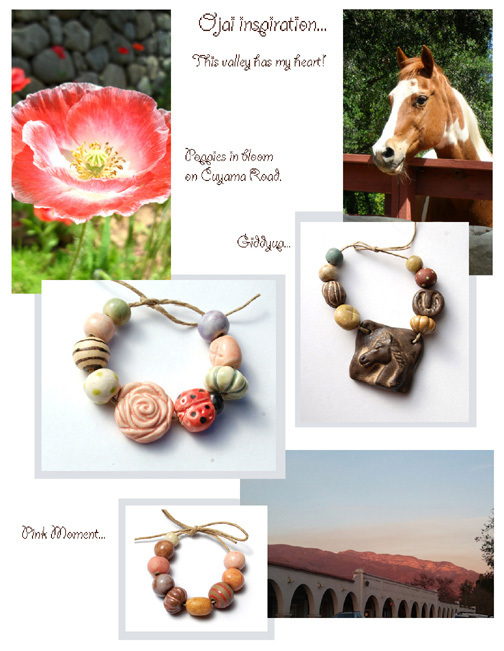 Gaea beautiful beads and inspiration. I am inspired by the seasons as soon as spring hits and the flowers start to bloom it is on to spring and summer colors, with the fall/ winter darker colors. Of course blog hopping and magazines is great for eye candy and inspiration too!! Nature is my #1 inspiration but I also find literature and poetry to be helpful. I love to look at paintings for inspiration incorporating colors and themes from them. I love your work, it is an inspiration to us all. Very unique designs!! I really love the Paisley Disk, Mermaid, and Owls Beads. How much for those Items? and how much for the shipping cost?